LOUISVILLE, KY (Monday, Sept. 14, 2015) – Churchill Downs Racetrackand University of Louisville student philanthropic group raiseRED today announced a partnership to highlight and raise money for raiseRED at the September 19 Downs After Dark presented by Stella Artois & Jack Daniels. raiseRED is a student run organization that supports pediatric cancer research and the children, families and doctors fighting pediatric cancer at UofL. Churchill Downs Racetrack will donate to raiseRED $2 of every General Admission ticket and $3 of every reserved box or dining ticket sold for Saturday’s Downs After Dark at http://www.churchilldowns.com/raiseRED. All funds raised by raiseRED will go to UofL’s Division of Pediatric Hematology & Oncology in the Department of Pediatrics. The evening will feature a rally in the Plaza from 6:00 p.m. to 7:30 p.m., during which former UofL athletes including National College Basketball Hall of Fame basketball player Darrell Griffith and Tim Henderson, a member of UofL’s 2013 NCAA basketball championship team, will sign autographs for guests. Guests will also have the opportunity during the rally to donate to raiseRED and win a pair of UofL football tickets to a 2015 game. Additionally, the fourth race of the evening has been named “raiseRED Race Four The Kids” in honor of raiseRED’s work. Other highlights of the evening include a presentation by Professor of Medicine and Chief, Division of Hematology/Oncology and Stem Cell Transplantation, UofL Department of Pediatrics, Dr. Kenneth G. Lucas from the Winner’s Circle at approximately 7:30 p.m. Dr. Lucas will introduce guests to the work raiseRED helps support. Among the projects supported by raiseRED is research to develop a vaccine to prevent recurrence of cancers in children. “The vaccine is designed to stimulate the patient’s immune system to attack specific tumor proteins, and then fight the tumor,” said Dr. Lucas, who also is the chief of pediatric hematology/oncology at Kosair Children’s Hospital. More information about Dr. Lucas’ work is available at www.UofLForKids.com. The theme of this Downs After Dark is Summer Sunset and guests are encouraged to break out their summer finery one last time. 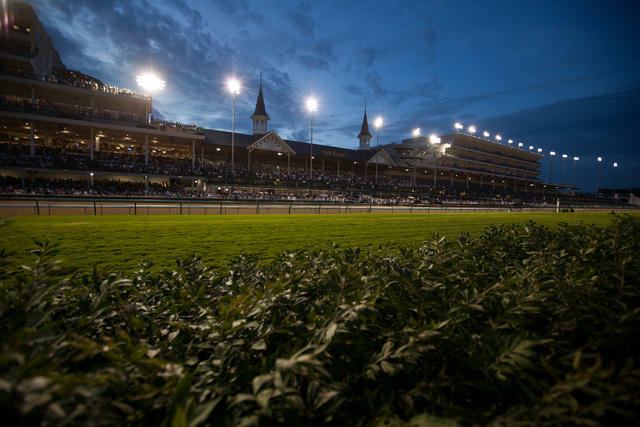 Kentucky Opera Singer Jennifer Poff, Soprano will perform the national anthem at 8:00 p.m. and A Lion Named Roar will provide live music in the Plaza at 8:30 p.m. Gates open at 5:00 p.m. with first post at 6:00 p.m.
Churchill Downs is offering two new seat packages for the event. The new Courtyard package for $69 offers 21 and older trackside seating and hospitality and includes wine and draft beer from 7 p.m. to 11 p.m., small plate food and a racing program.The new VIP Winner’s Circle Suite Package offers reserved seating for groups of 12 to 18 and includes all Courtyard amenities and personal in-suite food and beverage service.General Admission is $10, reserved box seats are $20 and dinner on Millionaires Row is $70. raiseRED is a student-run organization that supports clinical and medical pediatric cancer research efforts at the University of Louisville. The year of fundraising ends in an 18-hour Dance Marathon celebration, attended by hundreds of students. Last year, the group raised more than $226,000 for research.